> Research Library > Epicor > Still Risking Your Business on a Paper Bound Book? 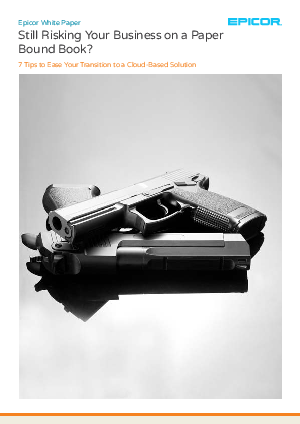 In today’s competitive market, FFLs often have inadequate tools that are hindering their growth, or are often sold software rather than solutions to their ATF compliance needs—leaving them confused and less compliant than before. Fortunately, it just got easier to streamline compliance processes and keep your Bound Book up-to-date. Discover how an Online Bound Book can ease operations and ATF compliance so FFL’s can focus what really matters - running a more compliant, efficient, and profitable operation.